Suffix Tree Searcher, or STS, is a Java program for building and exploring indexes of small or large amounts of DNA data. It connects to C programs that do the heavy lifting. The indexes are actually disk-resident partitioned suffix trees, and can be constructed for single or multiple DNA sequences in very flexible ways. The input format is fasta. The output is in the form of tabular results, generally showing longest common substring (LCS) matches among the input sequences. You can also search for exact and inexact occurrences of user specified strings. For a more concise description of STS and its controls, please see below for more resources. Portions of the VBRC documentation are present as “tool tips” in the GUI, upon employing the mouse-over action on controls. Windows is not currently supported!! 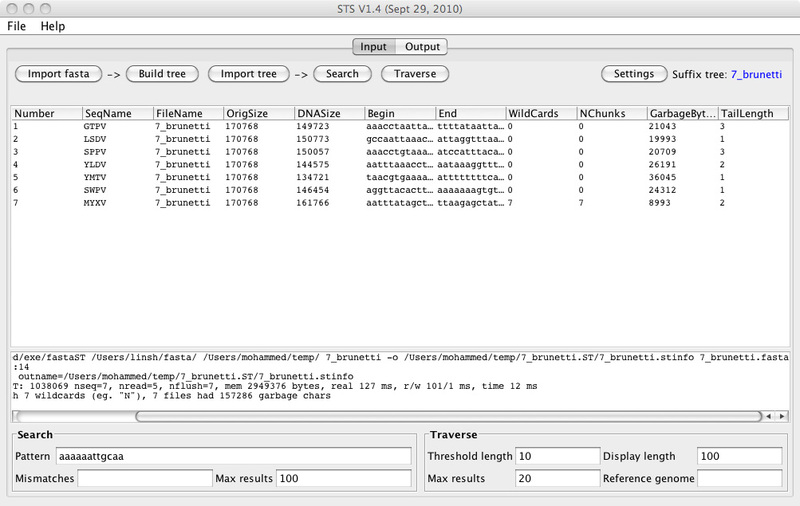 STS does not automatically search the reverse complement strand. if required, the pattern or sequences can be modified for these searches. The easiest way to get started with STS is to follow the Quick Start Guide. STS Manual; our comprehensive reference manual. If STS does not respond or generates an error like Error in calling executable: java.io.IOException: Cannot run program "/Users/john/exe/fastaST": error=2, No such file or directory when you try to Import, Build, Traverse, or Search, you may be missing one of the executables required. Check your ~/exe folder, located at /Users/[you]/exe in OS X, and ensure that the following wp-content/uploads/2018/12 are present in the folder: ssortST, mergeST, searchST, and fastaST. If one or more of these wp-content/uploads/2018/12 is missing, you will need to delete the exe folder, and reopen STS from an sts.jnlp file in order to re-generate the wp-content/uploads/2018/12.